NASA will continue its quest to study the elevation of the Earth’s surface and changes in the world’s ice caps when it launches the second Ice, Cloud and Land Elevation Satellite (ICESat-2). With a bus built by Orbital ATK, the ICESat-2 satellite is designed to provide elevation data needed to determine ice sheet mass balance, as well as vegetation coverage information. It will deploy a sensor to provide topography and vegetation information around the globe to help researchers better understand ice sheet elevation changes and sea ice thickness. ICESat-2 is scheduled to launch in 2017 aboard a Delta II rocket from Vandenberg Air Force Base in California. 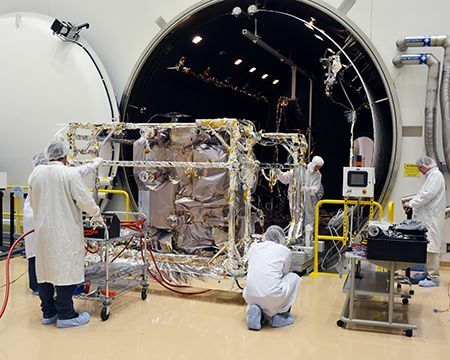 Orbital ATK’s ICESat-2 team prepares the spacecraft for rigorous testing in a vacuum chamber. As one of the leading providers of Earth science satellites with more than three decades of relevant experience, Orbital ATK seized the opportunity to be a part of this important Earth science mission for NASA’s Goddard Space Flight Center. The company designed ICESat-2 based on its LEOStar-3 spacecraft bus architecture that was used for NASA’s Landsat 8 satellite. The development, integration and testing is taking place at Orbital ATK’s facility in Gilbert, Arizona. The satellite was designed to have a three-year life span, but will be supplied with extra fuel to potentially extend mission life to seven years. The program continues to hit key milestones with solid support from Orbital ATK. The team is currently performing a risk mitigation thermal vacuum (TVac) test on ICESat-2. This test exposes the spacecraft to the vacuum and temperature extremes that will be experienced on orbit. The first ICESat was part of a directive by the National Research Council (NRC) to develop baseline measurements of ice sheets, topography and global vegetation characteristics, such as coverage and density of forests and jungles. The successful mission took place from 2003 to 2009, returning a huge amount of useful data. As a result, the NRC directed NASA to conduct a follow-up mission to continue the work and eventually build a 15-year record of changes to the Earth’s surface. In contrast to the original ICESat design, ICESat-2 will use a micro-pulse, multi-beam approach to allow scientists to determine a surface's slope with each pass of the satellite. ICESat-2 is equipped with a sensing technology called LIDAR (Light Detection and Ranging), which measures distances by illuminating a target with a laser and analyzing the reflected light. The instrument will improve elevation estimates in sloped areas, as well as rough land surfaces, such as crevasses. The ICESat-2 mechanism will also improve the ability to calculate the height difference between polar oceans and sea ice, ultimately ascertaining an estimate of sea ice thickness. ICESat-2 is expected to become an integral satellite among NASA’s Earth-observing fleet, sharing the story of how the planet’s surface changes over time. Learn more about ICESat-2 and Orbital ATK’s rich history of Earth science satellite development, visit NASA’s ICESat-2 site.